Above: In 1994, before restoration. 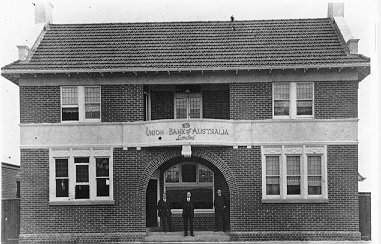 Located at 292 Commercial Road, Yarram (Victoria, Australia), the Union Bank of Australasia building came very close to being nothing but a pile of rubble in 1994. However, as is the case with many important public buildings, it took the initiative of a few concerned townsfolk to save the building from such vandalism. The (previous) Alberton Shire building surveyor stated, ‘It would cost far more to bring the bank building up to current public amenity requirements than it would to construct a new building. The bank building in its present form is not particularly useful and it doesn't satisfy societal expectations for commercial premises either'. It was against this attitude that the committee had to act. On Wednesday 8 December 1994, local resident Peter Stone heard that a contractor would be coming in on the following Saturday with bulldozers to demolish the building. As time was of essence, Peter Stone sought assistance from the National Trust and the Historic Building Council. The Regional Manager of the (new) Shire of Wellington, Mr Gary Stephens (who was Secretary of the previous Shire of Alberton) was approached to seek immediate approval from the Commissioners of the Shire of Wellington to delay the demolition order so that further dialogue would be possible. This was granted by the Commissioners, they having read an urgent fax from the Historic Building Council suggesting that demolition of the building may not be in the best interests of the shire. Although an Interim Preservation Order was not granted as the building was not of State significance, Heritage Victoria stated that the building was of local significance, and as such, ‘the proposed demolition should be deferred until a thorough conservation analysis of it has determined its significance'. The formal proposal to retain the building was presented to the Chairman of Commissioners, Mr John Guy, at the Shire of Wellington, Sale, for due consideration, and a decision was to be made at the next scheduled meeting of Commissioners on 19 December 1994. That the Shire of Wellington grant a deferment of the original order to demolish the Union Bank building at 292 Commercial Road, Yarram, for a period of six months, to 19 June, 1995 at which time a full and formal proposal will be presented to the Commissioners as to whether it is feasible to retain the building on the basis of facts and figures gathered from the community and professional parties. The Union Bank building was completed on 31 August 1914 at a cost of £2,689. The architect was Walter R. Butler, in partnership with a Mr. G. Insaif. The architecture was deemed Modernistic as compared to contemporary Federation design. Mr Butler was also responsible for the design of bank premises at Shepparton, Colac and Toora. The Historic Buildings Council does not regard the building to be of state significance, however Heritage Victoria considers the bank building to be of ‘possible local significance to the Yarram Community'. It is the only original bank building remaining in Yarram. The Union Bank building is currently occupied by Neighbourhood House, a community group offering a number of services including professional counselling, self-help and development, mutual support programs, health and community services. Also using the building were: Skillshare, Toy Group Inc., Parents Support Group, Yarram Community Education, Kilparrin Sexual Assault Cancelling, ADARDS - alzeimers support group, Yarram Photographic Society, Tenants Advisory Counsellor - Dept. of Planning & Housing, and Gippsland Women's Health, Yarram Community Radio. The Shire of Alberton had made no arrangements for the relocation of these community services. The Union Bank building occupies a significant position in the street scape of Yarram, being located at the southern end of Commercial Road, in the vicinity of the Club Hotel (1912), Yarram Hotel (1893), and the Federal Coffee Palace (1888 and 1906). The Union Bank building is structurally sound but sadly in need of renovation. It has been unsympathetically surrounded by a bus shelter (now removed), and a cream-brick and cement library building (1958). Significant, but repairable, damage has been caused recently by persons unknown, allegedly prospective demolition contractors, who have illegally broken through two locked doors into an occupied room of a tenant, and have damaged walls and ceilings presumably in order to determine the structural material prior to tendering for demolition. Tenders were called by the Shire of Alberton to demolish the building, and a tender subsequently let. This was due to take effect on 10 December 1994. The tenant had not vacated the building at that time, and still remains in the building. Rent has been paid by the tenant to 31 December 1994. As the tenants and interested parties were advised only on 7 December that the demolition contractor was due on 10 December, urgent action was required to ensure that the interest of the public was maintained. Several pages of argument were put to the Commissioners who accepted the report favourably and set a public meeting for 11 January 1995. At this meeting, Peter Stone made a presentation ‘calling forcefully for a moratorium of six months to enable facts and figures on the cost of retaining the building to be gathered. The claims of $180,000 to retain the building are simply not relevant. The building takes zero dollars out of the shire's coffers and a six month wait won't cause harm. Demolish it now and we may live to regret it later when the real costs become evident'. Asked by the ever-frugal Commissioners who was to pay for the report, Peter Stone said, 'I will'. Chairman of the Nightingale Community House Committee Mrs Lorna Tymensen also made a passionate plea for the building and criticised the previous council for seeking demolition tenders when tenants were occupying the building, and had paid their rents well in advance. The Commissioners offered a three-month stay of execution (not six months as requested) - and that Peter Stone would not be required to pay for the report. The Union Bank Committee immediately sought advice from architects and builders and commenced preparation of a formal report to council. In May 1995, the National Trust of Australia issued a ‘regional level classification' on the building. It was soon realised that the Union Bank building was of significant local interest. It has never been recognised as the most attractive building in town, but the effort to save the building was initiated mainly from a functional point of view rather than historic. Within months, the building was fully tenanted, and considerations were given to renovations. The building was found to be extremely solid with no movement whatsoever, and what was said to be 'concrete cancer' by members of the former council who argued for its destruction was not so, and only superficially cracks in cosmetic window surrounds required some patching. (Concrete cancer is a 'disease' of modern concretes where chemicals are added to facilitate quick setting). The roof required work and this was immediately attended to by a Melbourne contractor experienced in similar buildings. (The tiles came initially from France). Costs for these works were raised by the Union Bank Committee. Rather than seek support from the public by way of donations and raffles, the Committee organised a major exhibition of works by the renown textile artist Annameike Mein during the 1995 Tara Festival at Easter. This put a few dollars in the bank, and the Committee hasn't looked back since. On 12 December 1995, the Wellington Shire Council granted the members of the Union Bank Committee the responsibility for managing the building for a period of one year, ‘with an option to extend as required pursuant to Section 86 of the Local Government Act 1989'. The Union Bank building is now in the hands of the management committee and to this day the Wellington Shire has been supportive and not interfered in any way. Such was the success of the initial exhibition that the committee continued with the one major fund raising event at Easter; in 1996 the exhibitor was the textile artist Helen Joyce; in 1997 it was the sculptor, potter and painter John Rojo, and in 1998 a major exhibition of local wood craftsmen was staged. And to further participate in the festivities at Easter, the committee conducts the very successful Pancakes in the Park which raises a few more dollars. It should be mentioned that part of the success of the Union Bank Committee has been its structure. Every tenant gets a seat on the committee, hence it is in their interests to contribute - after all, it is their building. Communication is important, and the committee informs the Wellington Council of all major decisions. That there is little return correspondence is of no concern as it merely indicates that the council is satisfied. The Union Bank Committee has never asked the council for funds, nor has it any plans to do so. The work load on the committee is evenly spread, and if a working bee is required, the emphasis is on ‘enjoyment and achievement'. The generosity of the public is not stretched with continual demands for funds as the one major event at Easter covers maintenance costs. Since the ‘takeover' by the Union Bank Committee of Management, the committee has concentrated on the major structural needs of the building, rather than on superficial beautification. The roof was repaired, ceilings repaired where demolition vandals inserted sledge hammers, the toilet area has been brought up to an acceptable standard, rear access has been covered for weather protection, open drains have been covered, a rear access ramp installed, a digital lock system installed with security lighting, a new stove installed, and new floor covering fitted in the kitchen and toy room. The groundfloor area occupied by Neighbourhood House, the kitchen and dining area, and the front conference room have all been remodelled and painted. Neighbourhood House management have contributed tremendously to these projects, and working bees have supplied labour. It is now time to do the ‘fun' bits - the painting of the facade. Then the townsfolk may better appreciate the value of the dear old Union Bank of Australasia building. As a postscript, it is perhaps an opportunity to acknowledge here the efforts of specific individuals who have assisted in the retention of the old building, and its on going maintenance. Wellington Shire CEO Alan Humphries has been supportive of our project, as has Tim Wills, Alan Honey, Bruce Graham, George Wilson and John Teychenne from the Wellington Shire. (Get well, John, we miss you). John Guy, Chairman of Commissioners who took the time to listen, and acted. Local resident Peter Stone who 'saved the building' and is Chairman of the Union Bank Committee. All the committee members, past and present who have assisted so well with on-going management and running the fund raising events - Gaylene Coppa, Marian Gottliebsen, Dana Dunstan, Joy Evans, Andrea McCallum, Joe Dundon, David Hester, Bronwyn Stewart, Wendy Bouker, Ross Robinson, Gerry Ryan, Julie Brandsma-Mark. Ian Wight and Sally Sacazio from the National Trust of Victoria (Australia); and David Hill from Heritage Victoria. Loftus Overend from Best-Overend Architects for an initial report (at no cost) and willingly given advice. Kevin O'Dowd for doing the roof. Ross Coulthard from Hi-Ace Electricians, Jeff Kee from J.R. Kee Plumbing, and builder Mick Kerwin from Hedley, for their excellent service and price considerations. Thankyou also to Gary Stephens of Yarram Retravision, and Len Mayo from Thrifty Hardware for their assistance. And of course our major exhibitors Annameike Mein, Helen Joyce, John Rojo and the wood craftsmen. It has always been the promise of the Committee of Management not to seek donations from the local Yarram community, nor hand-outs from the Wellington Shire - although any contributions are always welcome. The Committee believes it must raise funding through active public events such as our exhibitions and involvement in the Tarra Festival, and other appropriate events. The Committee is, however, would be most grateful for any assistance received from the State Government, and in this regard, a grant on $12,500 for further renovation, on a one-to-one contribition basis, was presented to the building chairman Peter Stone, by the then Gippsland South MLA Peter Ryan. Many thanks are extended to Business Victoria (Mervyn Moon), and Wellington Shire (Tim Wills), for assistance in putting through the grant. Such funding has allowed for further external restoration of the building, roofing and electricals. External remodelling has included painting of the rendered facade areas and window surrounds, and the fixture of a replica of the original name of the building on the facade. The building thus adds to the beauty of the street scape for the southern end of the town and parklands. 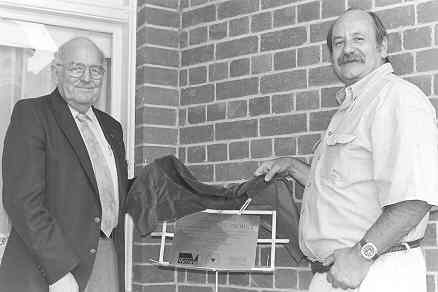 In February 2001, the renovations were completed and the building was officially re-opened by the Mayor of the Shire of Wellington, Cr.Gordon Cameron (left) seen here unveiling a plaque commemmoration the refurbishmnt of the building. With Mayor Cameron is Peter Ston, Chairman of the Union Bank Management Committee who co-ordinated the building renovations with wonderful assistance from the committee, and Neighbourhood House director and staff, Dana Dunstan and Joy Evans. In yar 2002, the majority of the work having been completed, it was decided by the Committee of Management that perhaps the future management of the buolding should lie with Neighbourhood House, the major tennt. On 1 January 2003, Neighnourhood House entered into a lease agreement with the Shire of Wellington. Anyone interested in the building may like to contact Dana Dunstan at Neighbourhood House on (03) 5182 6294.